Support for Scouts In Need to Attend Summer Camp! Is it time to make your Summer Camp plans? Don’t let financial barriers stop your scout from attending camp! 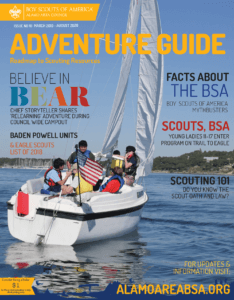 The Alamo Area Council (AAC) offers scout youth financial support of up to 50% of the early bird registration fee at Council owned properties and controlled summer camp events like Bear Creek ‘Scouts BSA’ Summer camp, WEBELOS Outdoor Adventure Camp (WOA), Tiger Cub Day Camp, Cub Scout Resident camp, Cub Scout Day camp, Exploring ALERT camp, Venturing camp, or Sea Scout summer camp. The family’s income aid is a traditional way to pay for summer camp. The Council has added popcorn and camp card sales so the youth of a unit may practice the Scout Law – a Scout is Thrifty. The Council suggests that Troops, Packs and Crews that have sold Camp Cards and Popcorn, track the amount those youth who have sold, produce, so they can use the money to go to camp during the summer. If the family of the youth is unable to pay the total cost of the Camp and the youth’s earnings from product sales are insufficient, then a Campership request is there to assist. The Campership, however, will only cover up to 50% of the camp fee. The Campership Committee meets once a month at the beginning of each month to review and award financial support. If your application or a unit endorsement is not received prior to that meeting, it will be held for the next month’s meeting. Each application requires a unit endorsement prior to being reviewed by the campership committee. Once an application is received the Unit’s Committee Chair and Scoutmaster/ Cubmaster will be contacted via email with a link to the unit endorsement form. Please fill out the unit endorsement in the scout’s name to the best of your ability and then submit it for review. The link to the unit endorsement form will be emailed out to the Unit Scoutmaster/Cubmaster/Crew Advisor and Committee Chair. Once a campership has been awarded, the email address on the campership application will receive notification of the results. It is the responsibility of this person to notify anyone else within the unit that may need to know. If you have any questions about the campership process, please email campership@alamoareabsa.org or by phone at 210-341-8611 x111. Campership grants are only available to registered youth scouts in the Alamo Area Council. Campership grants are non-transferable between Scouts. There is no deposit required for requests to be reviewed. Completion of a campership application does not guarantee a campership grant. Camperships are made available on the basis of available funds and verified individual need.